VWVortex.com - Single sidedraft manifold, something a little different. Single sidedraft manifold, something a little different. Thread: Single sidedraft manifold, something a little different. Did you do "lost foam" plug casting for that? There is an area of a normal brain that lets the owner know the object works and needs to be left alone. Not all of us have it. It is like being colorblind. No, conventional sand casting with a pattern and core. Here's what the mold and core looked like just before it was closed for pouring. how did you get the inside to be hollow? There's sand core inside the mold to make the hollow spaces, you can see it sitting inside the mold in my last post. yeah, but I can't figure out how it stays supported. It would be sand just supported on the edges and i don't know that stands up, right? Is the sand that sticky? btw, great to see someone willing to do something different! The sand in the main body of the mold is mixed with a little clay so it sticky to itself and will hold a shape kind of like the sand in a sand castle. The sand for the core is mixed with a binder that sets up like glue, the core is rock hard. What do you plan to do to face the flanges? Are you going to have them milled or do you plan on lapping them by hand against something like glass? Did you happen to find Dan's Workshop website when researching this? I expect they'll get milled but I'm not sure. I've pasted the casting on to the guy I made it for and I'm leaving those details to him. He's got the necessary equipment milling machines, surface grinders etc, he'll do what he thinks is best. He'll probably do it some time next week, after this weekend, there's a two week break in his racing schedule and he'd like get some dyno testing in during the break. 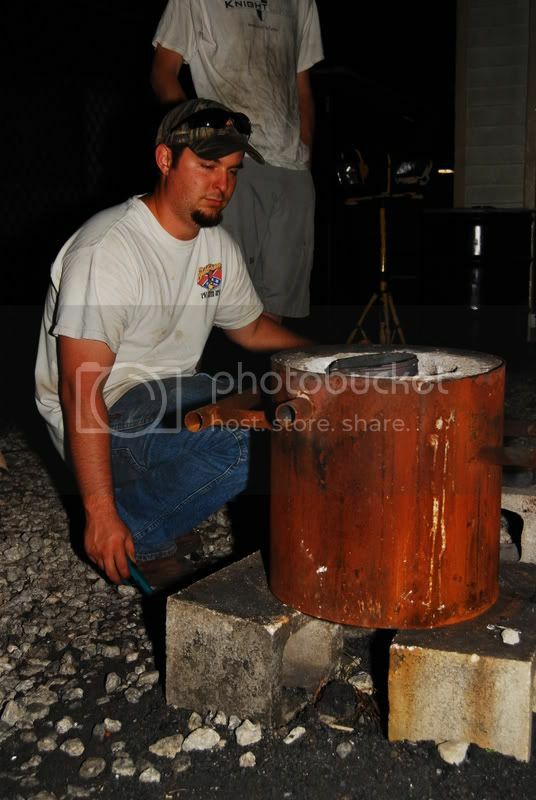 And yes I've seen Dan's site, I've looked at a ton of different metal casting sites including Dan's workshop. I was just thinking the other day, how it would be nice to make sand cast manifolds to try out different intake designs. Did you melt and pour the aluminum yourself, or bring it somewhere to be done? Where could I find someone who can do this? IE: Is this a backyard business, or some sort of rare profession to find? 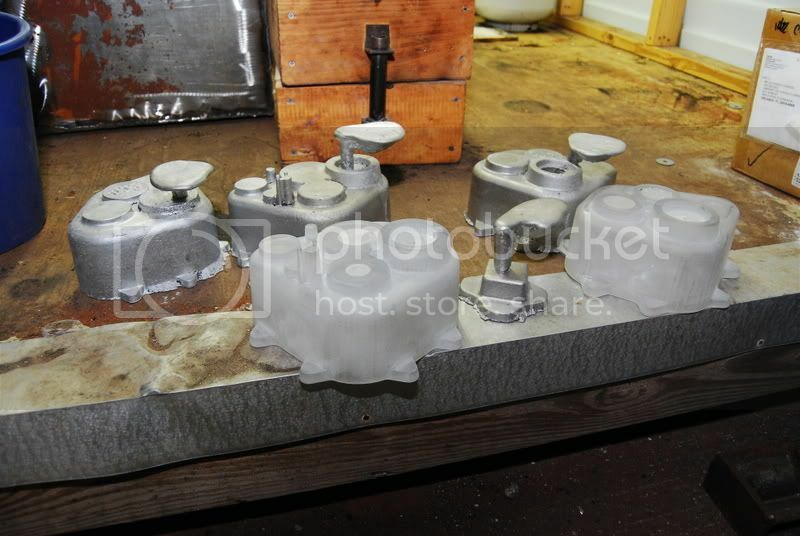 I did everything except the finish machining myself, patternmaking, mold making melting and pouring. I'm into this manifold for about $200+ but that includes stuff like my furnace and sand that I'll be able to reuse on other projects, the next project I do will cost probably a quarter of that. There are foundries that will do small one off projects, I went and visited one near Toronto earlier this year, it was very educational. I'm not quite sure how you'd go about finding a friendly foundry in your area. It's not unusual for people working on antique boats to have reproductions of stuff cast so maybe go down to the maintenance area of a local yacht club and ask around, indirectly, that's how I found the one I visited. Did you use a gas or electric furnace? What did you use for your aluminum? I used a big home made propane torch to melt it and the aluminium came for a VW alloy rim. I just cast a second one, I'm starting to get a handle on the surface finish issue, the latest one looks WAY better than the first. I helped out with a senior design team that made some cast parts for our SAE Baja cars. I want to try this but I need another hobby like I need a hole in the head. Are those transmission cases or something? What was the solution to your surface finish issues? It seems the first casting was poured too hot, a cooler pour made a huge difference. I'll put up another picture or two after it's been machined, hopefully that'll happen over the next few days. Haven't seen something this interesting on the VWVortex in a long, long time. That is really really cool. A long lost art. I would LOVE to see pics of it all cleaned up and machined. I'm also unclear as to how you sperate the core sand from the outside sand. Thanks Markku, given what I've seen of your work, that's high praise indeed. Anyways, the core is made separately and of a different sand than the main body of the mold. The main body is made with the pattern inside, the mold is then opened up and the pattern removed and the core placed inside (see my 3rd pic) then the mold is closed up for pouring. After the pour, the main body of the mold open up and that sand is very easily cleaned off but at that point, as you can see in my first pic, the core sand is still inside the manifold, it's quite hard and requires modest force to remove. Here's a picture of the core and the mold used to make it. It also shows very clearly the internal shape of the manifold. BTW, I talked to my buddy that now has the manifold, he's just finished machining it and tried it on the car for the first time today. He says that with the short runners and small plenum, the throttle response is amazing and it sounds really mean, I wish I'd been there. Unfortunately, it'll be 2 or 3 days before I'll able to check it out in person but when I do, I'll take a few more pictures and maybe even a short video and post them up.